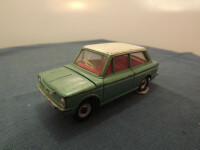 This model is the Dinky 138-G-1 Hillman Imp in Metallic Green. This is the RARE unlisted version with factory painted WHITE roof - it is not listed in any of the recognised references including "The Great Book of Dinky Toys", "Dinky Toys and Modelled Miniatures" (both by Mike and Sue Richardson), and "Dinky Toys" by Dr Edward Force (revised 7th Edition). For the purposes of coding it in my collection I have allocated it the reference 138-G-1b (a being the listed version) even though I suspect it was produced before the listed version with the white roof being discontinued as a cost saving exercise. The model features opening front luggage compartment (complete with tan luggage) and rear engine cover. All other features are cast into the body casting. At the front we have the lights, emblem, bumper and number plate highlighted in silver. This is the version with the cast headlights. The sides have cast door outlines and handles, and the rear has the cast tail lights picked out in red with a silver rear bumper. 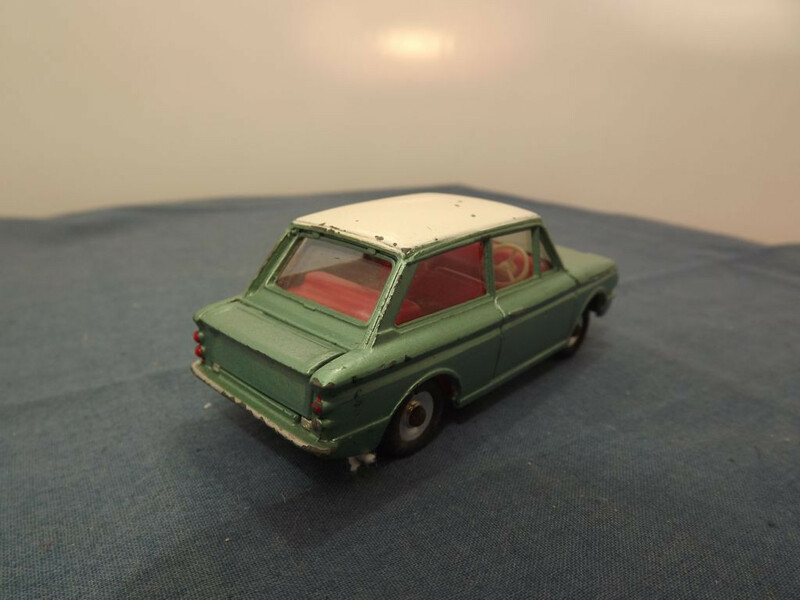 As previously mentioned this model has a factory painted white roof. 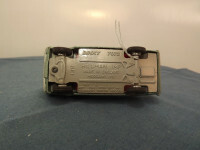 The interior is a red plastic vac-form unit with a white/cream steering wheel. The model has clear glazing all round. All wheels are of the shaped spun metal type - solid one piece spun metal hubs, with separate black "rubber" tyres. 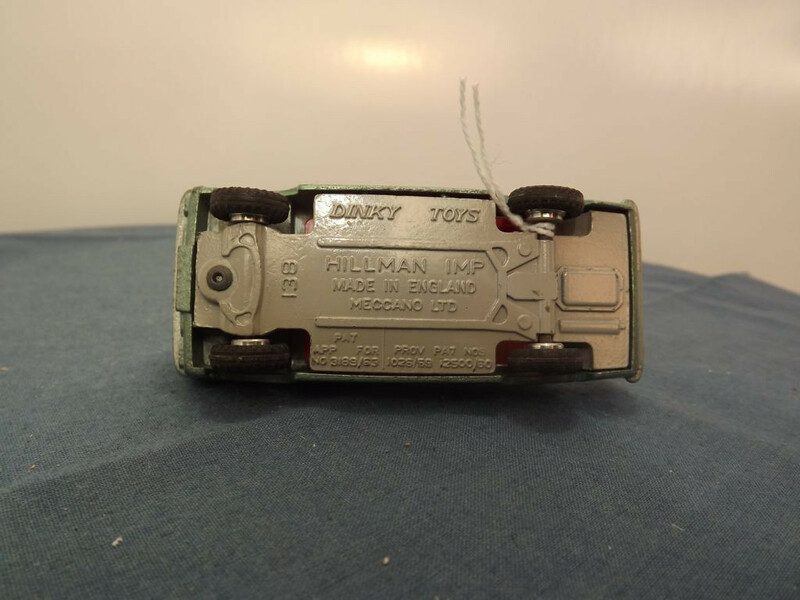 The base plate is light grey painted metal and is marked Dinky Toys at the centre top, "Hillman Imp, Made in England, Meccano Ltd" on three lines at the centre middle, "138" at the front middle parallel to the front axle, and "Pat, App For, No 2189/63" on three lines at the centre bottom to the left side and "Prov Pat Nos., 1026/59 12500/60" on two lines to the right. The base also carries a rudimentary depiction of the suspension, exhaust and engine sump. This item casting was used between 1963 and 1973 and I believe this to be a very early casting issued around 1963.